Of all the things that a driver usually wishes to avoid, at the top of the list usually sits Transmission repair. Phoenix has no shortage of less than reputable repair shops that will readily gut your transmission and charge a premium to put it back together again, but we see things differently at Tucker Tire and Auto. The fact is, major transmission service is usually avoidable if proper steps are taken to make the machinery last as long as possible. Our stance is that with proper transmission maintenance, serious transmission repairs can be avoided until well into the life of the vehicle. The key here is making certain that the transmission receives the attention it needs, at all the proper times. For example, Transmission fluid can easily be considered the life blood of your transmission. As long as the transmission fluid remains clean, it will provide the necessary lubrication and cooling effects that are required to keep the transmission in good health. This can sometimes be a tricky, because there is more to it than just adding a splash of fluid from time to time. Proper Fluid Level – Maintaining the proper fluid level is step one to avoiding transmission problems. Too little fluid and the transmission can quickly heat up, causing the machinery to become more malleable. Bent gears cause rough shifting and can even allow tiny metal shavings to break off and be cycled through the transmission. Curiously enough, too much fluid has essentially the same effect, the only difference being that the fluid first froths up and becomes useless as a lubricant. Transmission fluid filter – Over time, dirt and other contaminants will get inside your transmission and assault the gears directly. It is not difficult to imagine what happens to a finely tuned piece of machinery when sand is placed into the gears. The fluid filter of your transmission is what removes these contaminants and helps keep the fluid clean. If the filter is not changed at the prescribed time, the grime collected by the filter will simply be pushed back into the fluid. Fluid Exchange – Occasionally, completely changing the transmission fluid is necessary. There are two reasons for this. 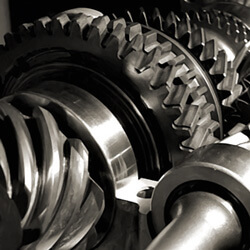 The first being that the fluid is subject to contamination through dirt, and the second being that the transmission will occasionally lose a small bit of metal from the gears which floats to the bottom of the fluid reservoir. Draining this reservoir is the only thing that can completely remove these bits of metal, and introduces new, clean fluid for lubricating and cooling the transmission. Keeping up with transmission maintenance is what will allow you to keep your transmission healthy for many years. Though it is impossible to never conduct more serious transmission maintenance, it is possible to hold back the day when a more comprehensive service is required. We understand that our customers are interested in getting the most out of their vehicles, and we want to make that possible. Contact us today if you need any information on what your vehicle needs. Our technicians are well trained and ready to keep you informed of everything that is needed for health and longevity of your transmission.